Federal investigators said Thursday in a preliminary report about a fatal Tesla crash in California that the driver did not have his hands on the wheel for six seconds before he collided with a highway barricade. The National Transportation Safety Board's initial report also stated that the vehicle, a Tesla (TSLA) Model X, had the Autopilot function engaged ahead of the March 23 crash. Tesla's Autopilot feature is not fully autonomous. It handles some functions, such as keeping a car in its lane or braking behind other vehicles, but not all. Drivers are expected to keep their hands on the wheel and engaged at all times when the feature is activated. The NTSB said on March 27 that two officials would conduct a field investigation into the incident. 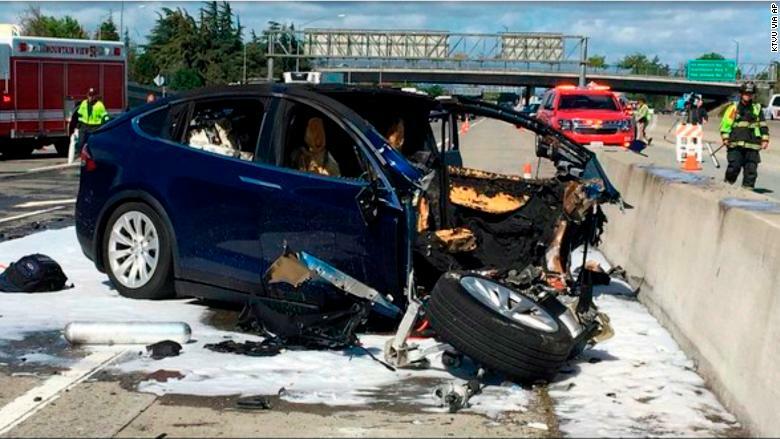 Its initial findings, posted online Thursday, back up what Tesla said in the days after the accident, which left the 38-year-old driver dead. But the report does not draw an explicit conclusion about the cause of the crash. The NTSB's preliminary report states that all "aspects of the crash remain under investigation as the NTSB determines the probable cause, with the intent of issuing safety recommendations to prevent similar crashes." A Tesla spokesperson declined to comment on the NTSB report, and instead pointed to a blog post the company issued on March 30. The blog post states: "The driver had about five seconds and 150 meters of unobstructed view of the concrete divider with the crushed crash attenuator, but the vehicle logs show that no action was taken." The NTSB report offers some details about the moments leading up to the fatal impact: The Model X's autopilot was set to keep the car's speed at 75 mph. About eight seconds before the crash, the Tesla was traveling behind another vehicle that was traveling 65 mph, which likely would have caused Autopilot to keep the Tesla at a slower pace. Then, at four seconds before the collision, the Tesla was no longer trailing another car, according to the report. The vehicle then began to accelerate in the moments before the vehicle collided with the highway barrier. The driver's hands were on the wheel for about 34 of the last 60 seconds before impact, the report states, and they were not detected on the wheel at all in the final six seconds. Earlier in the drive, the Tesla did emit two visual and one auditory alert to the driver to take control of the wheel. "These alerts were made more than 15 minutes prior to the crash," the report states. Tesla has faced criticism for calling its system Autopilot because the name implies the car can drive on its own. Some say it lulls drivers into a false sense of security, making them vulnerable to a crash. But Tesla and its CEO, Elon Musk, have slammed press reports about crashes. "The consequences of the public not using Autopilot, because of an inaccurate belief that it is less safe, would be extremely severe," Tesla's March blog post said.